Home Hardware Tech The ‘Almost-$7,000’ Commode! You might have to ‘sit down’ for this one—technology isn’t going down the tubes anytime soon for this particular plumbing fixture that will not only make the water spin, but could make your head spin, as well. 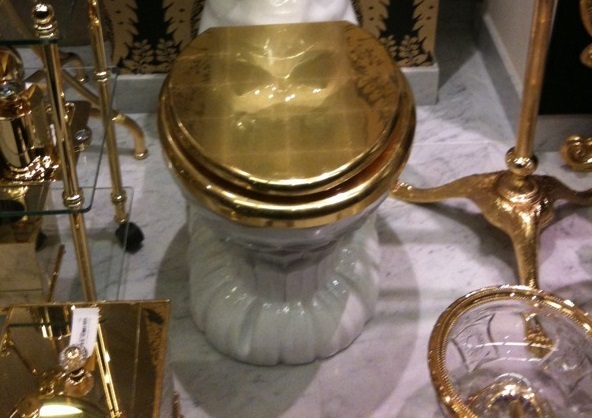 Talk about bells and whistles—at a price-tag of $6,650–this ‘throne’, is affordable for those who make a king’s salary, and is about as high-end as a latrine can get. If one so chooses, this royal flush (excuse the pun) features a Bluetooth receiver, which equips those who need to ‘take five’, the ability to stream music directly from their smartphones. As if that’s not enough, an onboard SD card and slot cater to those who might wish to create playlists or program a customized greeting. After all, if one lives alone, it would be nice to hear, “Good Morning, I hope you have a great day!”, even if it’s not quite a human voice. What Else Does This Techno-Marvel Offer? Built-in ambient lighting provides soft illumination around the commode so bathroom lights never need to be turned on in the middle of the night. As mentioned, smartphone music capabilities and voice programming are available, but this techno-dynamo also has pre-programmed audio and an FM radio and an MP3 docking station, just in case one might be staying longer than expected. Being pampered is what this lavatory is all about. Floor-level vents, at the toilet’s base, blow warm air onto the floor’s surface so feet will be bathed in spa-like comfort. The seat is programmable so you can adjust to your comfort level—a toosh temperature regulator–someone definitely had an imagination. A powerful charcoal filter is discreetly located on, and towards the rear of, the bowl to draw in unpleasant odors before they even get a chance to make themselves known. A blow dryer, located towards the back of the bowl, provides airflow exactly where it’s needed—presumably, in case no one replenished the TP roller. 7: Have You Had Your Bidet Today? A built-in bidet provides a selection of pampered options including spray pattern (pulsate, oscillate or wave), water pressure and temperature—all available according to your set preferences—no ‘if’s’, ‘and’s’ or ‘but’s’. Don’t ever think about using your hands to open or close the lid and seat again. Sensors located at the front of the commode can sense when the lid and/or the seat need to be raised. When the user leaves, the lid and seat, automatically, go back to the down position. Every option this crafty commode has to offer can be fine-tuned to suit one’s personal preferences. A touch-screen remote displays lighted icons to program or de-program settings; and a magnetic docking station makes sure the remote stays charged and secure. An entire family of 6 can program their own preferences for a customized experience. And last, but not least, the automatic flushing system will contribute to noticeable water savings—good for the wallet and for the environment!—Go Green! So next time you have $7K to blow and you really want to outdo the Jones’, give Clear Water Plumber a call or any professional near your area to get your throne installed. Karen has consecrated much of her retirement in Nebraska to writing and spoiling her grandchildren. Click here to learn more about Fort Worth plumbing services.